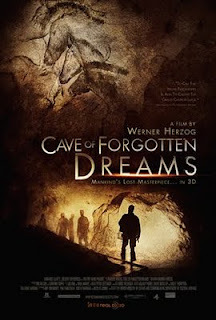 This morning I had the opportunity to see Cave of Forgotten Dreams in 3D, which opens in Austin this Friday. It is the latest film from, director Werner Herzog, who was given a rare opportunity to film inside a pristine cave in France. This cave was discovered a few years ago through independent exploration by a handful of people and once inside they found, what is believed to be, the oldest, preserved drawing on the planet. The original, natural entrance to the cave system was closed up by the disintegration of a cliff keeping the cave untouched and unseen by human eyes for centuries. Some of the oldest drawings in the caves have been dated at over 32,000 years old and still look very fresh due to a protective layer of calcification. The subject of the film is fascinating but I was equally fascinated by the documenting of the cave. There are many moments in the film, which had me wondering how a shot was captured or what the filmmaker had to go through to get into the spaces, in which they are shooting. Some of this is covered in the film itself. In order to keep the cave in pristine condition there were many restrictions placed on Herzog including, limiting his crew to 4 people and only allowing them a certain number of days and a limited number of hours within each to shoot. Cave of Forgotten Dreams is the first film I have seen that was fully live-action in 3D and it doesn't always work out perfectly. However, if you have the opportunity to see it in its intended 3D I recommend it. There are some low-lighting shots, in which the 3D looks grainy and can be a bit distracting but there are also some outrageously beautiful shots that look like you could reach out and touch a stalactite. Luckily, those of us in Austin can choose to see the film in either 3D or 2D. For those of you who only have vision out of one eye you can see Cave of Forgotten Dreams in 2D 35mm projection at the Regal Arbor Cinema starting Friday. For the rest of you, I would suggest you shell out a couple of extra dollars to see the film in, often breathtaking, and always mesmerizing, 3D at the beautiful, new, downtown art-house theater Violet Crown Cinema. The theaters are small but the screens are huge. If you sit in the front row in the comfy, reclined chairs you will feel like you're spelunking without those uncomfortable harnesses. If you haven't been to Violet Crown Cinema yet, you should know they don't show trailers before the films and the start time is firm so if you lollygag in late you're going to miss the film's setup. Also, you can park in the garage attached to the building and they'll validate your parking ticket, which boils down to $15 worth of free, convenient parking. They also have a beautiful and well-stocked bar/lounge area so arrive early, have a cocktail and appetizer but not too many cocktails the 3D might make you sick if you're drunk.